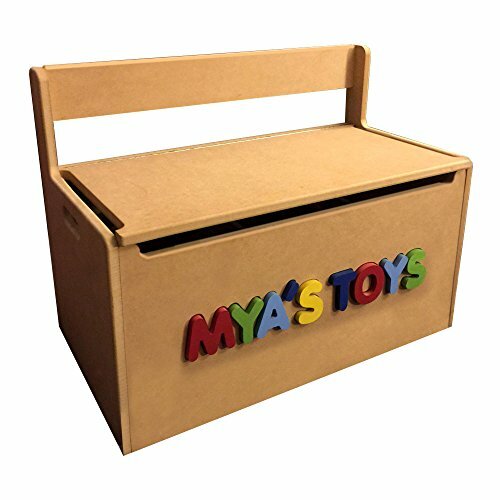 Give the perfect gift that will last for years with a custom-built kids toy storage box / bench seat with personalized 3D name embossed onto the front. Extremely sturdy - built using super strong 3/4", non-toxic, eco-friendly MDF and over-engineered to ensure strength, durability and long-life! Includes CHILD-SAFE flip-top lid, 2 removable internal dividers and convenient side handles. The Flip-top lid has 2 extra-strong lid-stays to ensure it remains up when you want it too. And the included dividers allow you to split the space into 1, 2 or 3 distinct areas; ideal to separate books, toys and shoes for example. The 2 side handles allow you to easily grip & move the storage box. Available in a wide choice of beautiful non-toxic colors or unfinished as a great DIY project with your kids or grandkids. As with all our products, it is made using 100% eco-friendly materials that contains zero-toxic chemicals (unlike traditional MDF) and organic paints that are safe enough to drink! Especially important when using products around our children! Delivered flat-packed. Requires minimal skill & tools to assemble - comes with fully illustrated instructions. Typical assembly time 10-minutes. If you have any questions about this product by ModRoomz Zubes, contact us by completing and submitting the form below. If you are looking for a specif part number, please include it with your message.